From the begging bowl to the bread basket: in just two years, Malawi has gone from famine to food surplus - according to national statistics. Smallholder farmers are being given access to new crop breeds; fertilisers; irrigation systems; and new techniques in crop rotation and soil management. Agro-science is helping families to cope with climate change and helping Malawi to buck the trend in neighbouring African countries. BBC science and environment reporter James Morgan has gone into the field to meet the families who are sowing the seeds of what is being hailed as "a uniquely African green revolution". 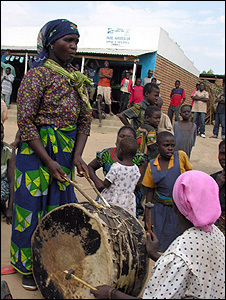 The women of Mnduka village are pounding their drums. Under the shade of a mango tree, a crowd is gathering around a masked man, who is twisting, thrashing, throwing himself at the dust, over and over again. He appears possessed - demonic, even. But everyone is cheering him. This isn't an exorcism, it's a celebration. "Gule Wamkulu" - literally the "Big Dance" - traditionally marks the end of a successful harvest. The masked figure is either a spirit, an animal, or a ghost - everyone I ask spins me a different spooky yarn. But what they all agree on, is that he has risen from the graveyard, "and he is very, very happy". Happy as everyone here in Mnduka village has been at harvest time, I am told, since the fertiliser subsidy programme began. I came to Mnduka to find out whether Malawi's much trumpeted "green revolution" is science fact or romantic fiction. Despite claims of a "food surplus", a national newspaper today carries a front page story warning of impending food shortages in six regions, affecting 1.5m Malawians - about one tenth of the population. Three years ago, Mnduka was a dustbowl too. 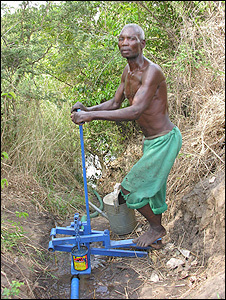 The drought of 2005 was as harsh here as anywhere in Malawi. Among the farmers, a quick show of hands reveals the vast majority were already growing high yielding varieties of hybrid maize. 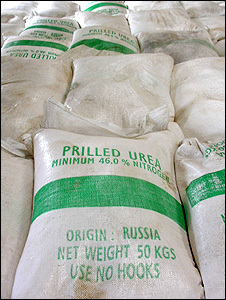 But without access to affordable fertiliser, their family stockpiles ran out in three months. "Every day, we had to look for work just to eat that night, says Esther Chirwa, 28, who supports a household of five. "We were living from hand to mouth." "I travelled far and wide just to find food," says Nixon, 58, who harvested only 10 bags, which had to feed a family of six for a year. "When you are away for so long, your family suffers." Today, as we are led between the maize fields, the place has the feel of an African fairytale. Down by the murky brown stream, the local farmers take turns to sweat it out on the irrigation pedal foot pump - mercifully shaded by bushes. The field alongside - once scrubland - is now blossoming into a small oasis of peppers and maize - "the garden" they call it. The idea is simple - one village garden will train a hundred farmers how to irrigate. The foot pump and simple water piping were funded by an NGO, but across Malawi, it is the government which has taken the lead irrigation, with an ambitious program to create a "green belt" stretching along the shores of Lake Malawi. "Remember - with irrigation, you can harvest three maize crops a year," says Phyness Thembulembu from US-based NGO Citizens Network for Foreign Affair (CNFA). Meanwhile, over on the hillside, the farmers are teaching each other how to plant cassava - a drought resistant alternative to maize. "The crop is common in other areas of the country, but back in 2005, very few here were growing it," says Phyness. "After the drought, they had to think again". But the centrepiece of the village model is the agrodealer. A local shopkeeper has been given grants and technical training to advise farmers on fertilisers and hybrid seeds. The shop is one of several thousand in a national a program funded by AGRA, and implemented here in Mnduka by CNFA. "In the past, the farmers had to travel 18km to access the high yielding varieties (CNFA has a target of 5km) - an expensive and time consuming trip, when you are struggling to support a household of six or seven," says Matthews Matale, an agrodealer from a neighbouring town. Now the seeds are on their doorstep. With support from CNFA, the agrodealer holds annual crop demonstrations and the farmers choose the seed variety they favour. "The most popular in my shop," says Dinah Kapizan, "are the maize seeds that come in animal varieties - monkeys, elephants and lions. "Monkeys are the quickest to maturity, the elephants next, and then the longest, but with the greatest yields, are the lions." A clever marketing ploy, but it's simpler than remembering the difference between MH18 and DK8A31. I for one, am grateful. 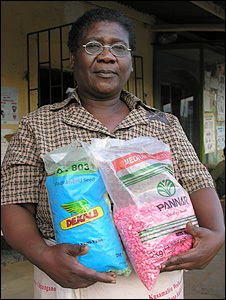 Esther, too is grateful for the seeds, the shorter travelling distance to the agrodealer, and most importantly, the subsidies. "It's clear we are having bigger harvests now, with the fertiliser. I am able to sell some. The only thing I fear for is what happens if they take the subsidy away." The dependency cannot be underestimated. The biggest round of applause under the mango tree was not for the wild ghost-man dancing, but for the local headman - when he called for fertiliser to be stocked here in the village, like the seeds. "My worry though, is can this really be sustainable in the long term? ", says France Gondwe, of Malawi's World Agroforestry Centre (ICRAF). "The Nitrogen fertiliser is a quick fix - but without it, the harvest is low, because the soils are suffering from years of [monoculture]. Even with the fertiliser, they are not performing to their full potential. "There are alternatives to fertiliser - crop rotation, manure, agroforestry. But with the food shortages, the government is trapped. And so the people are trapped too." Back under the mango tree, the mysterious masked man takes a bow and races off through the crowd, and over the hill in the direction of the graveyard. Mnduka too has risen from the graveyard - but the dancing goes on, for now at least. Piled 19 bags high; when I say bags, I'm talking about the kind of sacks you can dam rivers with. I tried lifting one. At 50kg, that was a big mistake. I left that to the army of youngsters with Popeye biceps, who were loading Malawi's mammoth maize harvest onto lorries, bound for government sales depots around the country. "If you came here just a few years ago, you would find this storage depot totally empty," says Feckson Kantonga, operations manager for the government-sponsored Agriculture Development and Marketing Corporation (Admarc). Feckson is standing at the foot of a pile of maize as tall a house. He has put his best suit on to welcome a Kenyan film crew, who had come from Nairobi to find out the secret of Malawi's success. How exactly can it be, they are wondering, that their prosperous nation has come to depend on little old Malawi (the 13th poorest nation in the world) to supply its staple food crop? "Malawi?" asks Peter, a business journalist. "We Kenyans know nothing of Malawi. I had to look the place up on Google to find out what the heck was going on here." The answer is hidden inside the sacks. They are fat-packed with new hybrid corn varieties - strains that were unheard of in Malawi a decade ago. Bred by multinationals in Malawi, or crop centres in Zimbabwe and Sudan, the plants are high-yielding and fast-growing - plants with bigger cobs and shorter maturation periods. With global warming, it is essential the plants make the most of any rains while they last - "a crop for every drop", to quote the motto of the Alliance for a Green Revolution in Africa (Agra). But the most popular hybrid varieties are those that remain "poundable". That is, the grains can still be beaten into flour in the traditional way. "Are you telling me you have you never pounded maize, James?" smiles Cathy, a Kenyan journalist, with a cheeky wink. "You know in Kenya, a woman is not considered fit enough to be a bride until she can pound a bag of maize. And a boy is not a man until he can build a house." Where does that leave me? Still out of breath from lifting the maize sack. And it is not only maize. There are hybrids for every local crop - cassava, sweet potato, soya, ground nuts and legumes. But the most remarkable thing about these "miracle seeds" is that many are not new at all. "They have been with us for decades, but they never made it to the fields," says Agra's Fred Muhhuku, an expert on agronomics in East Africa. "Traditionally, farmers have either been too poor or too afraid to take a chance on these new varieties, even though they can triple their yields," he explained. "If they plant their hardy traditional strains, they know that come drought or flood, some crop will survive to harvest. The harvest will be tiny - maybe 800kg per hectare - but it is guaranteed, so they take no chances." The result was six successive years of food shortage in Malawi - beginning in 2000. "And there was no lack of rains, I can tell you," says Dr Jeffrey Luhanga, technical co-ordinator at the Ministry for Agriculture. "I experienced the famine in 2005; there were lines of people queuing for food aid. "The thing you have to remember is that these were the ones who were still strong enough to walk to the depots. The hungriest - the ones who really needed the food - they were stuck at home, starving. 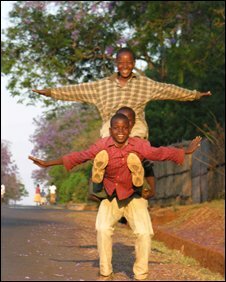 "Now look around Malawi, you see only healthy faces. Yes, this is a green revolution. And it is being driven by science." He reels off a list of programmes - irrigation, agronomy, planting patterns, science-based economic practices. "These technologies have been in our research institutes for years, but they went nowhere. Now, for the first time, the technology is in the farmers' hands." It begins with the seeds. The hybrid maize varieties are high yielding - around 2,500kg/hectare or more. "I grew 80 bags this year, in the land just around my house. Eighty bags!" says Mitengo Gamr, one of Admarc's regional managers. "My family no longer queues to buy food." But they come with a catch - they are addicted to costly nitrogen fertiliser. "But it is worth the investment," explains Muhhuku, "because the extra maize you grow, you can sell to pay for the fertiliser, buy an animal for your farm and diversify. You can build security." And what if the rains fail? "Then you have enough left over from your big harvest last year," he smiles. "It's true, it's a different way of farming and it takes some convincing." The other drawback is what is known as post-harvest management. The hybrids yield more flour, but the grains are less resistant to worms and weevils. "In some places, you lose 40% of your storage," says Muhhuku. The answer, inevitably, is pesticides, another expensive input. The margins are still favourable, but what if you can't afford to invest in the first place? This is where the Malawian government has stepped in. A month or two from now, 1.5m of the poorest subsistence farmers will begin arriving at Admarc's depots, clutching four coupons: one for seeds, two for fertilisers and another for legumes. This year, for the first time, pesticides will be subsidised too. It's an enormous cost burden for a developing economy to bear - which is why the past, African governments have preferred to rely on private investment and foreign aid. Malawi has gambled - and last year, the reward was millions of dollars of maize export revenues. "I am just back from New York, from a UN conference, where they had an entire session dedicated to Malawi," beams Dr Luhanga. "Other African countries - they want to know if they can follow our example. Kenya, Tanzania, Swaziland - they are thinking of introducing subsidies. This green revolution - it is truly for the whole of Africa." Where is the catch? Certainly, the revolution has not stopped the market price of maize from doubling in a year - from 30 kwachas (£0.12) per kilogram to 60 kwachas. The government, controversially, has passed a law capping the price at 52 kwachas - an emergency measure. But utter the words "technological dependency" to Muhhuku, and he simply shakes his head. "We hear this accusation from western development workers. We are told 'why make farmers buy seeds every year? Why let the companies trap you?' But this is based on a misunderstanding. Storing the hybrid seeds - it takes a lot of technical knowledge. "The farmers can stick to their traditional ways. But the yields are not worth their sweat." Tomorrow, I will meet the farmers and ask them myself. "If [environmentalists] lived for just one month among the misery of the developing world, as I have for 50 years, they'd be crying out for tractors and fertiliser and irrigation canals." So said Norman Borlaug, one of the founding fathers of the original Green Revolution - credited with wiping out starvation in Asia. But can technology really be the saviour of Africa's struggling farmers? It has become a terribly unfashionable opinion in the UK, where "green" campaigners are no longer content to denounce GM crop trials. They simply rip them up. "Responsible biotechnology is not the enemy," said Borlaug. "Starvation is." I have decided to take Norm up on his wager, by coming to Malawi to see for myself. Because no matter how many UN reports I've ploughed through, grasping the root cause of the current "food crisis" in Africa is anything but straightforward. And neither is my journey to Malawi - a sweaty overnight haul which takes me via Kenya, Zambia, and several re-runs of Indiana Jones films. But for heroic inspiration, I look instead to a speech by Kofi Annan, the new chairman of the Alliance for a Green Revolution in Africa (Agra) - a $200m, pan-African programme, funded by the Bill and Melinda Gates and Rockefeller foundations. "Let us generate a uniquely African Green revolution," says Annan, cutting a heroic pose on my crumpled transcript. "There is nothing more important than this." It is difficult to argue. Over the last 50 years, African farmers have laboured in the heat, while countries like Mexico, India and the Philippines have undergone a green revolution - applying novel fertilisers and pesticides to churn out bumper harvests of new high-yield varieties of wheat and rice. Meanwhile, Africa has been cultivating greater and greater poverty statistics. Sub-Saharan Africa is the only region in the world where per capita food production has steadily declined. One third of Africans are malnourished. Soils are among the most depleted on Earth. Farmers do not have access to productive seed varieties and those that do have neither the knowledge nor the tools to reap the harvest. Slash and burn still reigns. Climate change is forecasting ever more variable rainfalls, and more frequent droughts. Add in soaring fuel prices and the scourge of HIV/Aids, and the average African finds himself surrounded in the kind of perilous predicament which from which even Harrison Ford would struggle to escape. But it is this very challenge that has drawn the world's crop scientists and agro-economists to Malawi. They hope to pioneer novel farming systems that propel Africa towards a new era of food security. It has already been dubbed by members of the UN Food and Agriculture Organization (FAO) as "a greener revolution". "Greener" because it works with ecosystems, not against them. A revolution that is "pro-poor and pro-environment", in the words of Mr Annan. Over the next week, I'll be taking a look at these projects first hand - catching fish in the desert, planting strange trees in the middle of maize crops. I'm wondering how women and men, who have been sowing the same maize seeds for generations, really feel about the new hybrid varieties of seeds which are more nutritious, but also more hungry for expensive pesticide and fertiliser. Most of all, I'm curious to find out whether the "miracle" we have read about here in Malawi is bona fide or illusory. Is the revolution underway, or a simple matter of better rainfall? The facts are these. 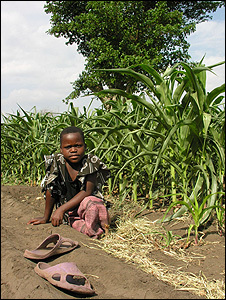 During the last decade, Malawi suffered six successive years of food shortage, culminating in 2005. One third of the population - 4.5million people - went hungry. 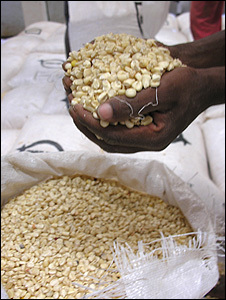 Step forward two years, and Malawi is exporting more than one million metric tonnes of maize, its staple crop. The government, against the advice of the IMF and the World Bank, has handed out vouchers to 1.5m of the country's poorest farmers, enabling them to buy "inputs" - seeds, fertiliser and pesticides. Meanwhile, yields have mushroomed. 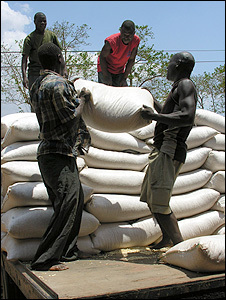 Malawians are selling maize to Kenya and giving food aid to Zimbabwe. The success was hailed last year with Oxfam's Malcolm Fleming describing to the BBC how Malawi was going against the grain of African agriculture. So when I bump into Malcolm, a well-kent face in my native Scotland, on the flight to Lilongwe, I don't hesitate to offer a warm handshake of congratulations. "I'm afraid that things have moved on since then," he sighs. "The harvests have been great, but still the food prices in Malawi are still rocketing." Why? "That's the question," he continues. "The closer I look, the more complicated it becomes. 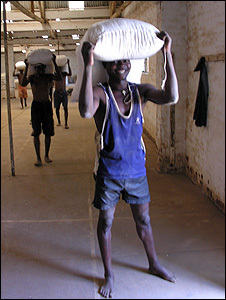 But from what I gather, the maize is being sold abroad at greater prices, and that keeps the prices up in Malawi." Malcolm is here doing research in the lead up to World Food Day on 16 October. Helping him to raise awareness is another familiar Scottish face, but I'm afraid I am sworn to secrecy. All will be revealed in due course. 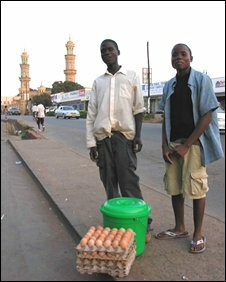 "Rising food prices might not be much of a problem for me or you," says Mr Fleming, "but if you spend 80% of your household income on food, and then the price doubles..."
It is a welcome serving of realism pie to chew on as I step out of Lilongwe airport. The pavements are covered in a blanket of purple blossom - it looks like a fairytale. And the boys cartwheeling down the red dirt roads seem full of beans. But the lumps in their bellies tell a different story.